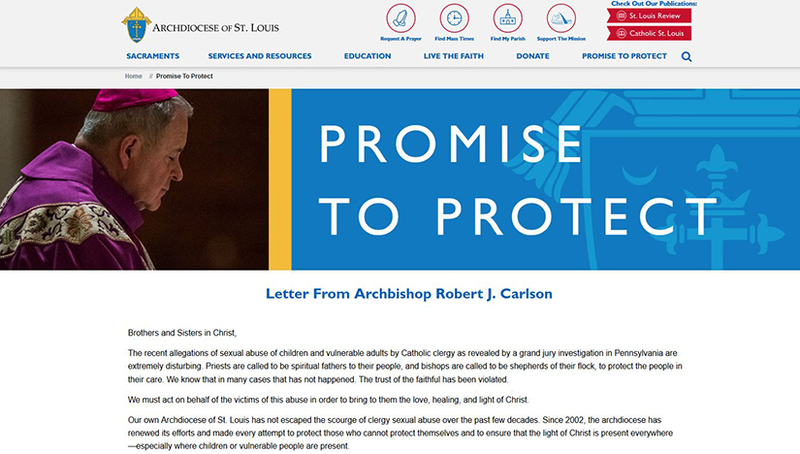 A screengrab from the Archdiocese of St. Louis' new web page with information on how the archdiocese continues its promise to protect children. Anew page on the Archdiocese of St. Louis’ websiteseeks to provide context about the recent clergy sexual abuse scandal, including information on how allegations of abuse are investigated and other resources. The page includes sections with an explanation of the investigation process, statements from Archbishop Robert J. Carlson, frequently asked questions, a glossary of terms and additional resources. In a letter mailed to Catholic households in the archdiocese this week, Archbishop Robert J. Carlson offered an apology to those who have been abused by clergy and for those who have suffered because of the Church’s cover up of abuse. “I apologize to all people whose faith has been shaken by this behavior,” he wrote. • 400 Protecting God’s Children workshops held annually. In his letter, Archbishop Carlson addressed structures of accountability, noting that the archdiocese has taken “many steps” to ensure that abuse does not happen. He added that more should be done, including an invitation to Missouri’s attorney general to review the files and procedures in the archdiocese pertaining to sexual abuse. To report any suspicion of abuse by any Church personnel, please contact local law enforcement or the Missouri Department of Social Service Child Abuse Neglect Hotline at 1 (800) 392-3738. In addition, anyone who has knowledge of sexual abuse or misconduct by a member of the clergy, employee or volunteer of the Archdiocese of St. Louis should call the Office of Child and Youth Protection at (314) 792-7704.